The belt was not finished, I needed to add something to make it close in the back and its done now and the belt is ready to go. I do have both skirts the inner and outer. I need to finish the cape (doing that tomorrow and I think that is the last big piece..). The Obi is 6 inches and the belt is 2", makes it 2" on either side of the belt, I will modify this if I need to. Thanks for the input! Got my blackout mask in. The white writing on the neck will be going away. Thanks, I hope it will be done too. Though it will be close. We have gotten the skirts finished and are currently working on the sleeves. I do not have pictures of them yet though. This is both inner and outer tunics. I adjusted the contrast and brightness of the picture so the details can be seen. 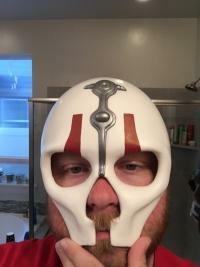 I've started work on my Darth Nihilus, I have purchased a mask from Scott and am following his tutorial. I'm super excited to complete this and hope to have it done in time for celebration!